Certain University policies and regulations affecting most students are included in this Catalog. Other regulations are set forth in various materials provided to all new students. In general, students are expected to meet the University’s academic requirements, attend classes regularly, conduct themselves as responsible members of the community, and meet their financial obligations to the University and to the residence groups to which they are assigned. The University provides many services to support the academic success of its students. Several of those programs are described below. Academic advising is a critical component of the educational experience, developed through collaborative mentoring relationships between students and advisors. 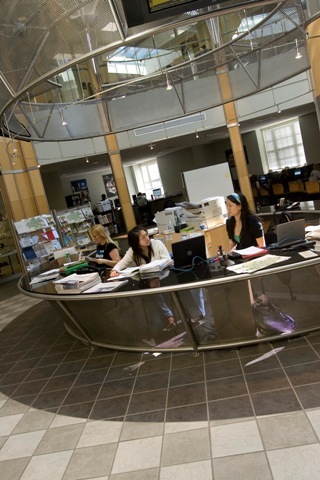 With support and guidance from the University Director of Advising undergraduate advising programs are administered by the advising center directors in the various schools and colleges in Storrs and by student services directors at the regional campuses. The deans of the schools and colleges assign advisors to help students meet their academic goals and complete degree requirements. Although the advisor is responsible for making appropriate academic recommendations, students are responsible for their own academic progress. Referring the student to appropriate sources for information and specialized services. Students and advisors should know the academic requirements published in the University Catalog and departmental plans of study. Before registering, students consult with their advisors. The University tries to meet the students’ requests where course selections conform to University rules and where resources permit. Academic Achievement Center: The Academic Achievement Center (AAC) assists students in attaining their academic and personal goals by providing a comprehensive, personalized array of programs, resources, and services that enhance skill development, effective decision-making, and personal transitions to and within the university setting. Students can visit by walk-in or appointment. Each student is paired with a coach for a one-on-one session. Students are welcome to return and meet with a coach as often as they want. Professional staff are available by appointment. Please call or email to schedule an appointment. Rowe Center for Undergraduate Education, Room 217; Phone: 860-486-4889; aac@uconn.edu. Academic Center for Exploratory Students: With expert academic advising and staff, ACES helps students navigate the most efficient route to their selected field of study. Rowe Center for Undergraduate Education, Room 111; Phone: 860-486-1788; aces@uconn.edu. Center for Academic Programs: The Center for Academic Programs (CAP) increases access to higher education for high-potential students who come from underrepresented ethnic or economic backgrounds and/or are first-generation college students. Rowe Center for Undergraduate Education, Room 231; Phone: 860-486-4040; cap@uconn.edu. Center for Career Development: Career Services assists students in gaining and applying knowledge and skills to make well-informed career decisions by advising them through the process of identifying a major, exploring career interests, and securing post-graduate opportunities. The office serves as the clearinghouse for internships and cooperative education which are an important part of the educational and career development process. Wilbur Cross Building, Room 202; Phone: 860-486-3013; career@uconn.edu. Center for Students with Disabilities: The Center for Students with Disabilities (CSD) offers comprehensive services. Their staff seeks to accommodate students with documented disabilities to allow them equal access in their educational endeavors. Wilbur Cross Building, Room 204; Phone: 860-486-2020; csd@uconn.edu. Dean of Students Office: The primary function of the Dean of Students Office is to help students and their families get answers and solutions to college life questions or problems that students may have. Wilbur Cross Building, Room 203; Phone: (860)486-3426; Email: dos@uconn.edu. Digital Learning Center: The Digital Learning Center staff helps students with HuskyCT, E-portfolio, Huskymail, and the Student Administration System. Homer Babbidge Library, Level 1; Phone: 860-486-1187; learningcommons@uconn.edu. Education Abroad: Studying abroad is a great way to gain proficiency in another language and to experience a new culture. John W. Rowe Center for Undergraduate Education, Room 117; Phone: 860-486-5022; studyabroad@uconn.edu. International Student and Scholar Services: International Student and Scholar Services (ISSS) supports the internationalization of the University of Connecticut through the development and delivery of services and programs that help our international students, scholars, faculty and staff accomplish their academic and professional goals at UConn. McMahon Hall, Main Floor, Suite 183; Phone: 860-486-3855; international@uconn.edu. Language and Cultural Center: Students can find support for second language and culture through the Language and Cultural Center. The Department of Literatures, Cultures and Languages offers tutoring by graduate students who are heritage speakers of their respective languages. Level One, Homer Babbidge Library; Phone: 860-486-6255; learningcommons@uconn.edu. Learning Community Program: The communities create a small world on a large campus. Students live on the same floor, eat in the same cafeteria, and take the same classes with students who share their interests. Descriptions of the wide variety of programs and an application form can be found on the Learning Community Program website. Office of First Year Programs and Learning Communities: With courses, a personal support network, interactive online resources, and unique living/ learning experiences, First Year Programs helps new students achieve success from the start. Rowe Center for Undergraduate Programs, 2nd Floor; Phone: 860-486-3378; fyp@uconn.edu. Office of National Scholarships and Fellowships: The Office of National Scholarships and Fellowships (ONSF) advises and mentors high-achieving students at the University of Connecticut who are competing for prestigious national and international scholarships and fellowships. Rowe Center for Undergraduate Education; Room 419; Phone: 860-486-4223. Office of Undergraduate Research: The Office of Undergraduate Research (OUR) provides research-related opportunities and information to interested students. OUR is an enrichment opportunity for all undergraduates in all majors on all UConn campuses. Rowe Center for Undergraduate Education, Fourth Floor; Phone: 860-486-7939; our@uconn.edu. Pre-Law Advisement: The UConn Pre-Law Center is committed to working with students and alumni who wish to become legal professionals. Rowe Center for Undergraduate Education; Room 419; Phone: 860-486-4223; prelaw@uconn.edu. Pre-Medical/Pre-Dental Advisement: The UConn Pre-Medical/Pre-Dental Center is committed to working with students and alumni who wish to become health professionals. Rowe Center for Undergraduate Education, Room 419; premed_predental@uconn.edu. Quantitive Learning Center Tutoring: The Q Center runs an extensive drop-in tutoring area, focusing on lower-division (but, not exclusive to) Q courses in Chemistry, Mathematics, Physics, and Statistics. Quantitative Learning Center; Homer Babbidge Library, Level One; Phone: 860-486-1961; qcenter@uconn.edu. Student Health Services: The University of Connecticut Health Service is a health care facility that is fully accredited by the Accreditation Association of Ambulatory Health Care Facilities. Student Health Services, 234 Glenbrook Road; Phone: 860-486-4700; shs@uconn.edu. Students Engaged in Academic Leadership: UConn SEAL is designed to cultivate leadership and engagement among talented UConn students. Wilbur Cross Building, Room 112; Phone: 860-486-2461. Student Support Services: Student Support Services increases access to the University of Connecticut for first-generation, low-income and/or underrepresented students with the goal of their retention and graduation. Accepted students participate in a six-week summer program prior to the fall semester of their freshman year, providing an introduction to the rigors of university academics. Students are assigned to a Counselor or Regional Coordinator who provides them with advising, support, and advocacy during the summer program and throughout their tenure at UConn. Specific contact information for the Avery Point, Hartford, Stamford, Storrs, and Waterbury campuses can be found on the Student Support Services website. UConn American English Language Institute: UCAELI offers a full service intensive English program for students of English as a second language. McMahon Hall; 2011 Hillside Road; Phone: 860-486-2127; register-ucaeli@uconn.edu. UConn Compass: UConn Compass is an involvement program that promotes student engagement through co-curricular involvement. The program helps students to explore opportunities available at the University and helps them connect with campus life in a positive manner. Wilbur Cross Building, Room 301; Phone: 860-486-8402; community@uconn.edu. UConn Connects: UConn Connects is an intervention program to help students be more successful academically. Students at the University may participate in the UConn Connects program on a semester-by-semester basis. Rowe Center for Undergraduate Education, Room 217; Phone: 860-486-4889; uconnconnects@uconn.edu. Veterans Resources: The Office of Veterans Affairs and Military Programs provides support for our veterans, guardsmen, reservists, active duty, and dependents as they adjust to the academic and social terrain at the University. Specific information regarding veterans’ financial aid is available through the Office of Veterans Affairs and Military Programs. Arjona, Room 340; Phone: 860-486-2442; veterans@uconn.edu. Writing Center: The Writing Center is a faculty-led staff of tutors from disciplines across the university available to support students at all stages of the writing process. Homer Babbidge Library, Level 1, Room 108; Phone: 860-486-4387; writingcenter@uconn.edu. The Family Educational Rights and Privacy Act of 1974, as amended, protects the privacy of educational records, establishes the students’ rights to inspect their educational records, provides guidelines for correcting inaccurate or misleading data through informal and formal hearings, and permits students to file complaints with the Family Policy Compliance Office of the U.S. Department of Education concerning alleged failures of the institution to comply with this Act. In compliance with this Act, the University of Connecticut publishes detailed FERPA information online and sends notification to students via e-mail. Graduation Rate. The Student Right to Know Act of 1990 requires each institution to make available the graduation rates, within six years, of entering freshmen classes. For students who entered the University of Connecticut as freshmen in Fall 2011, the graduation rate by the summer of 2017 was 83% for those who entered at Storrs, and 61% for those who entered at a regional campus. Non-graduates may have completed degrees at other institutions. Students needing certification of enrollment or academic status for loan deferments, job procurement, scholarships, insurance, international student I.D. cards, licensing exams, admission to graduate school or other purposes may obtain the necessary documentation from the Office of the Registrar or through the use of the Student Administration System via the internet. Students at Storrs and the regional campuses can request official transcripts of their academic records by writing to the University of Connecticut, Office of the Registrar, Wilbur Cross Building, Unit 4077T, Storrs, CT 06269-4077. Requests can also be faxed to the Registrar at 860-486-0062. All requests should include full name, date of birth, Student Administration System USER ID (if known), dates of attendance, complete and accurate addresses of transcript recipients including ZIP codes, and the requester’s address, telephone number and e-mail address in the event that there is a problem with the request. All requests, including faxes and email attachments, must be signed. Students can also request official transcripts through the Student Administration System. Request forms can be completed at the Office of the Registrar in the Wilbur Cross Building and submitted for processing. These forms are also available at the regional campus registrars’ offices for mailing or faxing to the University Registrar at Storrs. An online version is also available. Students can request that their transcripts be sent to themselves. Note, however, that such transcripts are stamped “issued to student in a sealed envelope” and the envelope bears a similar stamp and a signature. Students are advised that some recipients will not accept transcripts that have not been sent directly to them. For Priority/Express mail service, the request must be accompanied by a pre-paid and pre-addressed envelope(s). Carriers available are U.S. Postal Service, FedEx and DHL. All arrangements must be made by the requestor. There are other restrictions to this service. Official transcripts may be withheld if financial or other obligations to the University remain unmet. Because official transcripts are issued on security paper, they cannot be faxed. The University cannot honor telephone or ordinary e-mail requests for transcripts. Any student can obtain an unofficial transcript via a computer that has internet access by logging on to the Student Administration System using their unique NetID and password. Unofficial transcripts are also available at the Office of the Registrar at Storrs or at any of the regional campuses; however, students should call the regional campus registrar in advance to make arrangements for transcript pickup. The primary role of the Office of Student Financial Aid Services (OSFAS) is to reduce the financial barriers that limit access to a higher education at the University of Connecticut. This is accomplished through the offering of financial aid packages to eligible students that consist of scholarships, grants, loans, and part-time employment. While students and parents are primarily responsible for funding a UConn education, the OSFAS makes every effort to provide assistance in the event that income from family, wages, savings, and other financial resources are insufficient to cover the cost of a UConn education. Complete the Free Application for Federal Student Aid (FAFSA). UConn’s priority filing deadline is March 1 and Federal School Code is 001417. Students whose applications are received after the deadline may not be eligible for certain types of financial aid. Submit required documentation: In the event that the U.S. Department of Education selects your FAFSA for verification, be prepared to submit documentation to the OSFAS in order to substantiate the data reported on your FAFSA. You will be notified via your email account if additional documentation is required to continue processing your financial aid application. Upon notification, access the ‘View Financial Aid’ link in the Student Administration System to determine what information must be submitted to the OSFAS. Additional information about the verification process is available Financial Aid Website. Accept your awards: Upon notification via your email account that your financial aid award is ready for review/action, access the Student Administration System to accept/decline your financial aid award and complete all steps in the “View Financial Aid” link. Incoming freshmen and transfer students begin receiving their award notifications in mid-march. Continuing students will begin to receive their award notifications in mid to late April. Maintain Satisfactory Academic Progress: Federal Regulations require the OSFAS to review the academic progress of students who apply for and/or receive financial assistance. All aid applicants are required to maintain a designated grade point average (GPA) and satisfactorily complete a percentage of the number of credit hours attempted. A complete text of these requirements is available on the Financial Aid website. For more information about the financial aid process, eligibility requirements and important deadlines, please visit the Financial Aid website. HuskyCT and University e-mail each require the use of a Net identification number and a password. The NetID and password become important tools to be used to register for classes, obtain grade transcripts and schedules, and change contact information. Questions regarding NetID and password should be referred to the ITS Help Center. Each student is assigned a randomly selected, unique USER ID number, which is used primarily by administrative offices as an identifier in the Student Administration System. 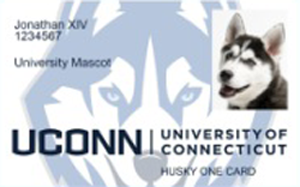 Husky One Card, the official UConn ID. Each student is issued a photo identification card. The card is used to obtain services such as dining, residential life, and library. It is also the identifier used to gain entrance to some campus social events. The initial card is obtained at the One Card Office, as are replacements. The social security number (SSN) is collected to enable the University to comply with federal requirements mandated under IRS tax laws and the Title IV student aid legislation and for other administrative purposes. The University assigns each student a unique identifier that is not the SSN that is used for most administrative purposes. If the SSN appears incorrectly on any University document, the undergraduate student must present a social security card indicating the correct number to the Office of the Registrar. Undergraduate students must report any change of name and commuting or permanent address at the time such change occurs to the Office of the Registrar. Name changes require official documentation. Changes made by the Registrar’s staff will update the information that appears on the University website’s Directory of students’ names and addresses. Changes to current mailing address and telephone number can be made through use of the Student Administration System via the Internet.